On March 15th, the Roman Martyrology commemorates St Longinus, who is traditionally said to be the soldier who pierced the Lord’s side with a lance on the Cross (John 19, 34), as well as the centurion who said “Truly, this man was the Son of God.” (Matthew 27, 54) His legend states that he suffered from a malady of the eyes, which was healed when the some of the blood that came forth from the Savior’s side touched him. The apocryphal “Letters between Pilate and Herod” also claim that he was one of the guards at Christ’s tomb, and not only witnessed the Resurrection, but spoke with the Lord Himself shortly afterwards. After preaching the Gospel and living a monastic life near Caesarea of Cappadocia (later the see of St Basil the Great), he was martyred by beheading. 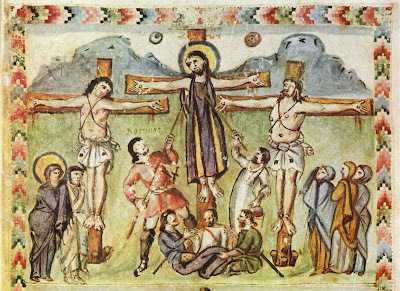 An illustration from a Syriac Gospel book now kept at the Laurentian Library in Florence, known from the name of the scribe as the Rabula Gospels, dated 586 A.D. The name “Longinos” is written in Greek over the soldier on the left with the lance, but this may be an addition by a later hand. There are a great many variants to the story, which cannot be regarded as a reliable hagiography. The city of Lanciano in the Italian region of the Abruzzi claims him as a native son, and that his martyrdom took place there instead. The city of Mantua in Lombardy, birthplace of the poet Virgil, claims that he preached in that region, and was martyred there, and furthermore, that he brought to that city relics of the Lord’s Precious Blood, and the sponge which was used to give Him vinegar during the Passion. These are now kept in the crypt of the basilica of St Andrew, which was begun by the famous Renaissance architect Leon Battista Alberti in 1472, but only completed in 1732. Our Ambrosian correspondent Nicola de’ Grandi recently visited the city, and took these photos of the basilica. 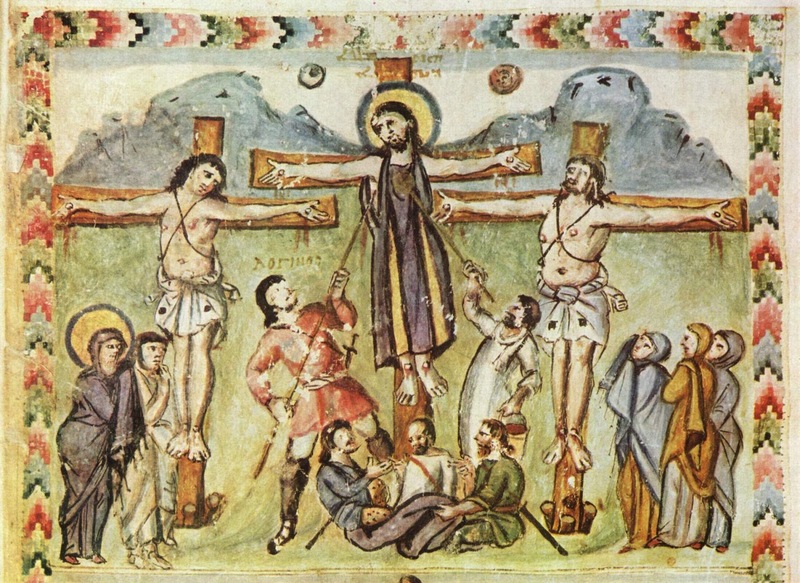 The story is told that the relics of Christ’s Blood brought to Mantua by St Longinus were hidden for safekeeping by Longinus himself, and discovered in 804 when St Andrew the Apostle appeared to someone to reveal their location. (Similar stories are told about many of the famous and more improbable relics of the Middle Ages.) The rediscovery of the relics is here depicted by Giulio Romano, a disciple of Raphael who did an enormous amount of work in Mantua under the Gonzaga dukes; the Crucifixion scene below is also his. The relics are kept in a safebox which requires twelve keys to open, and is only brought out for an exposition once a year on Good Friday; custody of the keys is divided between the basilica, the bishop of Mantua, the chapter, and the civil prefect of the city. The reliquaries seen here on top of the box are copies of the originals inside it. The martyrdom of Saint Andrew in the apsidal fresco. The nave seen from closer to the sanctuary.